First some explanations. When I moved to Tennessee from Alaska, one of the first priorities was to learn the "lay of the land" and to find all the best woodworking suppliers. I knew from experience that going direct to the sawmill was the best way to buy wood if you knew what to look for. Then I realized that many others either hadn't learned this yet or had been unsuccessful in locating sources. 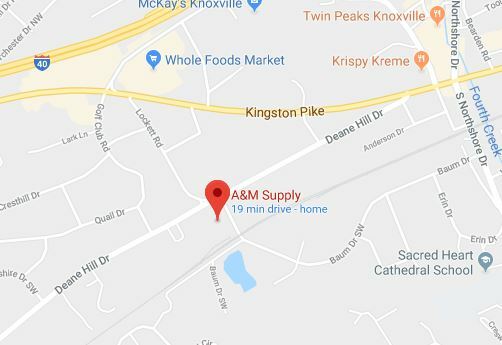 To assist those looking for sawmills and other sources of woodworking supplies in the general Knoxville area, I have created an ongoing list which includes contact information and maps to assist local woodhunters. As a validation of my ideas about the general hunger of woodworkers for affordable wood I undertook a field test. On February 5, 2000 I lead an eight-vehicle caravan of woodworkers recruited at the Badger Pond Woodworking Forum on a trip to three local sawmills selected to be as different as possible. Watching everyone snapping up wood and loading their vehicles with smiles on their faces was enough to convince me I was on the right track. By the way, the attendees included woodworkers from as far away as Nashville, Georgia, and South Carolina so the wood hunger is not an isolated local fact. The most frequent complaint among woodworkers on the Internet seems to be about the scarcity of good wood and the high prices. I frequently advised people in rec.woodworking and at the now-defunct Badger Pond Forum that their best option is to simply locate their local sawmills and to buy there. Sometimes this is easy, sometimes it isn’t. It certainly seems to be easier in the eastern part of Tennessee than in many other areas of the country. As an aid to woodworkers in the Knoxville area, I will list the sawmills and other economical suppliers that I know of ranging as far as the bordering counties of our neighboring states. If you have comments about this listing, the sources, the quality of service and material available, or if you know of other sources not listed, please contact me. I hope to get out and scout for some more suppliers but your leads could save me a lot of blind driving up and down the “hollers” looking for sawmills. This company included for sake of completeness. They are a STRICTLY WHOLESALE operation catering to the commercial cabinet and furniture market. They sell virtually anything these businesses might need. As such they don’t take too kindly to a hobbyist dropping by for a sheet of plywood or a few sticks of lumber. They are willing to handle orders for reasonable (by their commercial standards) quantities from members of the East Tennessee Woodworker’s Guild however. I have not visited this mill but Bill contacted me and asked that he be included on this list. He operates a portable bandsaw mill and primarily operates on-site sawing the client's wood. Since this is a service that I've been asked about so many time it seemed only natural that I should include this listing here. Some others on the list have equipment which is theoretically able to do on-site sawing but almost nobody actually provides the service. Bill says that he occasionally has his own logs avaiable but that is not his primary service and what is on-hand varies constantly. You should also note that once wood is sawn you will be responsible for drying and processing it further. Bill says that road names and such have changed in his location and finding his address could be problematic. Definitely call him first! But since his primary service is on-site sawing you may not really care where he parks his equipment. This is another mill that I haven't visited but Mark is a member of the East Tennessee Woodworkers Guild and got in touch with me asking that his Lucas mill / dehumidification kiln be included in this list. He has just started running his kiln with his second load of oak. He has some other species but you'd be best off calling beforehand to see if what you want is available. Good advice for any of the small operations listed here. 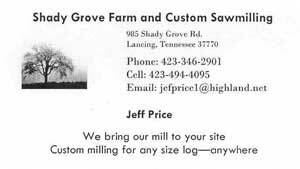 Mark describes his location as "about 5 miles SW of Maryville, ½ mile off of 411"
I have not visited this mill but Lee is a member of the East Tennessee Woodworkers Guild and got in touch with me asking that his bandsaw mill / dehumidification kiln be included in this list. He had twelve species in stock when he contacted me including some quartersawn pine which was sawn from sinker logs retrieved from the river. He says that he also cuts free edge slabs and rustic pieces. A wild surmise about getting there based some map reading. Heading south from Etowah on US Route 411 you should be looking for Wetmore Springs Road which appears to be a synonym for CR 854. This will be a right turn. Just in case, I'd advise that you call ahead to verify the proper route and to be sure that someone will be there. What looks like a regular little hardware store has surprises. They sell furniture hardware, kiln-dried oak and poplar lumber, and shop grade plywood. Good prices on plywood but it pays to inspect to find out why it was downgraded to “shop”. Very easy to find. Drive north on route 11E from Knoxville toward Strawberry Plains. The store is on the left side immediately before a Clayton mobile home sales lot. Lynda Hughes Dawson Lumber Co.
A mid-sized mill with two saws which has another expansion in the works as I write this. They sell kiln-dried lumber from all of the expected Appalachian hardwood species. They will also sell green if you want it and have a stock of veneered plywood to match their solid wood products. Simple to find if you don't make a boneheaded mistake like I did the first time. Leave I-81 at exit 50 and drive south on route 93. You will come to a crossroads where route 81 joins; go straight through and soon you will find the sawmill on your right. A mid-sized circular saw mill which sells local hardwoods in the rough and green. They don’t stock huge amounts of sawn wood but their stock of logs is immense. An interesting operation, and one you should ask to see, is their “back room” where they produce quartersawn white oak for cooperages around the world. Simple to find. The mill is located about three miles south of the junction of 441, 338, and 411. Take 411 south from that point and the mill will be on your right. Obviously this isn’t all that close to Knoxville, Nashville is more like it. I’ve included it because a regular at Badger Pond reported it as an extremely cheap source of air-dried local hardwoods. Like good cherry at $1.50/bf! From Knoxville, head toward Nashville on I-40, south on I-840, northwest on route 41, west on route 102 (Nissan Dr), northwest on old Nashville Hwy, southwest on Kent Dr, northwest on Tedder Blvd, then southwest on Rocky Fork Rd. At this point you are on your own – but the road isn’t that long. Good luck! A mid-sized operation selling the standard local hardwoods, mostly green. The owner says that he does occasionally have kiln-dried wood in stock but that it is spotty. Had a good amount of steamed/dried walnut the day I was there. Off of route 353 not too far from Telford. Beyond that you’ll probably be better off calling and asking to make sure since this is another that was found by accident and not properly researched and recorded. An old circular saw mill Jerry admits that he is “pretty much out of the business” although he occasionally saws some logs when they become available. He says he has some stock of air-dried oak, poplar, and pine that he can part with though. This is pure conjecture since I have never been here. 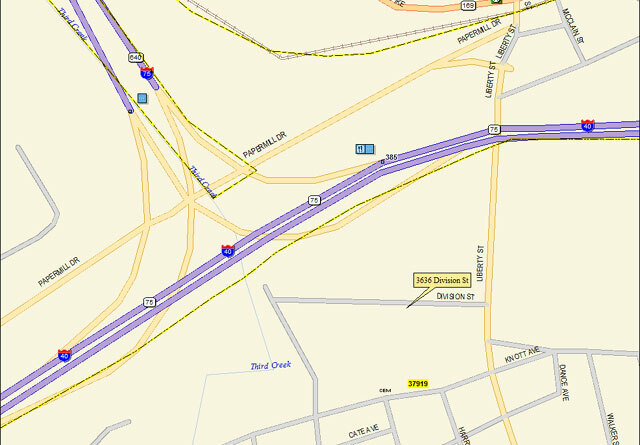 I’d try turning south on route 299 from I-40 and then take route 70 west, looking for Dogwood Road on the left. I have not dealt with this company but they were recommended for inclusion on the list by a member of ETWG. To quote Joel, the owner: "We are strictly a portable sawmill business, going the customers site to saw logs. I do offer site preparation for people who do not have the equipment using a 743 Bobcat equipped with a grapple bucket to stage the logs for sawing at an additional cost to the sawing fee. We do not saw the trees down or trim the limbs prior to sawing, that is a different business that requires more insurance and you have to be bonded. I do stock limited supplies of lumber in cherry, walnut, oak and poplar for someone who needs small qty's... As you can see on the website we have two mills. A LT40 Super Hydraulic and a LT 50... I do have a log trailer with a knuckleboom loader that I tow with my 2500 heavy duty pickup with a capacity of 14,500 lbs. to move logs for customers we saw for, again on a limited basis." Since, in this case, the sawmill is intended to come to you the exact location isn't of much importance. But if you are curious their website has a map you can refer to. Most entries in this list are about cheap lumber but sometimes cheap isn’t the greatest motivation. Jeffries is a family-owned retail supplier of fine wood. When you just must have a certain piece of wood and don’t want to hunt around the hills, head there. What you are buying here is always top-quality kiln-dried graded lumber and the offerings go far beyond the run-of-the-mill local sawmill offerings and includes many exotics. This is especially important if your shop equipment or personal inclinations are not up to processing rough lumber into usable furniture wood. Heading south on Broadway (route 441) from Knoxville’s center continue until you see a huge cemetery on the left with the huge Valley Grove church in the distance. Turn left and drive past the church. This leads to what used to be the old Camel tent factory but which is now a sort of industrial park. Follow the signs to Jeffries. A circular saw mill that seems to sell all the standard local hardwoods. I wasn’t able to get much out of the owner to be honest so I don’t even know if the wood is dried or not. Perhaps I shouldn’t have shown up in the Miata with the top down – a dead giveaway that I must be an outsider. Take your pickup if you go and maybe you will blend in better. Located to the south/east of Roan Mountain on route 19E about three miles before the North Carolina border. Sits back off the road on the east side but is clearly visible when traveling in either direction. A very large operation although I didn’t get a chance to look around. What drew my attention to it was a semi-trailer sitting by the road and painted for use as a billboard. Said the place was a “hardwood outlet” but it looked and sounded like a sawmill. All the standard hardwoods, kiln-dried, as well as dimensional construction lumber. 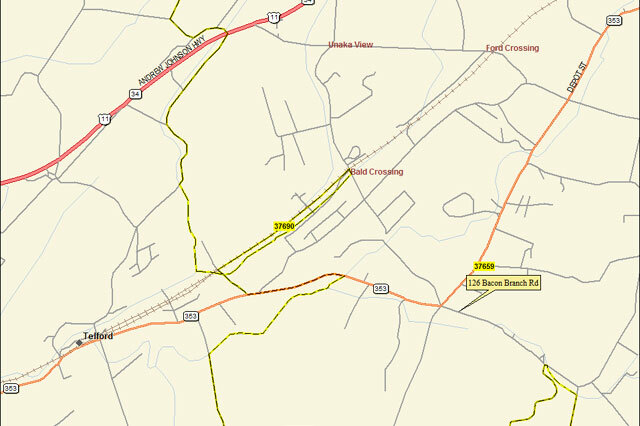 Located on route 19E perhaps 15 miles before the North Carolina border. I can’t give an exact location since I wasn’t paying close attention and found the place only by accident. Look on 19E north of where route 173 joins it and you won’t be far off. This is a bandsawmill. The owner was in the process of building a new shelter for the equipment as well as for drying wood when I was there. He has a bit of dried wood in his barn but more should be available this summer. Off of route 27 southbound from I-40, watch out for Black Creek Road to the right. A useful landmark is a huge retaining wall on the left side of 27 not too far before the turning point. 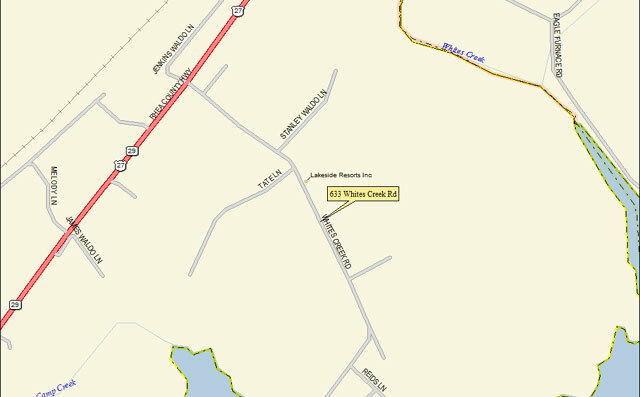 Drive out Black Creek and watch out for a barn/house/heavy equipment on a dirt drive to the left. This is the place. There was no number on the mailbox when I went out so that won’t help you. This is a wholesale operation that sells “by grade” meaning that the wood is graded FAS or #1 Common or whatever and you accept it as such – basically you don’t get to pick through the stack and choose what you want. Although wholesale, the owner says he will sell retail to local woodworkers. Mill and kiln are located in NC. North American and exotic hardwoods are available. You must call ahead to make arrangements as the owner is often out of town. Not terribly difficult to find as long as you know where the alternate campus of Pellissippi State is located in the Liberty Street area. 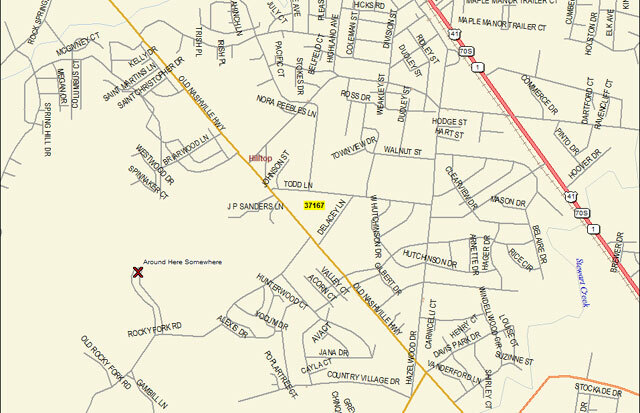 Otherwise, you can follow Middlebrook Pike (route 169) west and turn left on Liberty Street. Wood lot is located on a steep downhill. A near-antique circular saw mill. Owner cuts local woods but has no drying facilities. He says that the wood leaves as fast as he can cut it so he doesn’t have time to try drying it. A real bear to describe how to get here. Doubly so because my mapping software is very confused about road names out in this area – those that are given names are often wrong. Try this: driving west on route 70 past Midtown look for a Caney Ford Church right before the Roan County Park. Turn south between these two onto Caney Creek Road. Follow this across a yellow bridge and then keep bearing left on the main road. At a “T” intersection, go left and look for the Loop Road turnoff on the left side also. Good luck! This company is a large dry kiln operation that handles essentially every Appalachian hardwood species. They also have a smaller retail operation that caters to local crafters, woodworkers, and cabinet shops. I haven’t bought there but they have been recommended as being good people to deal with. No map. 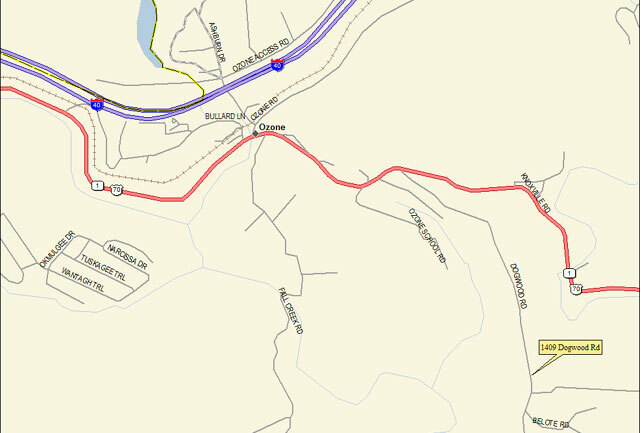 Cold Springs Road is equivalent to route 91 north from Mountain City and I would estimate that it isn’t too far outside of town. As I remember, there is some attractive scenery to be seen further up the road heading toward the state line so this might not be a bad ride to take with the family. A small bandmill operation which sells very inexpensive air-dried lumber. This place can be tough to locate, especially if you believe the address given. Ignore the address and look at the map and directions! Probably the most difficult-to-find place on this list. Not the sort of place you’d be likely to stumble over on a Sunday drive. 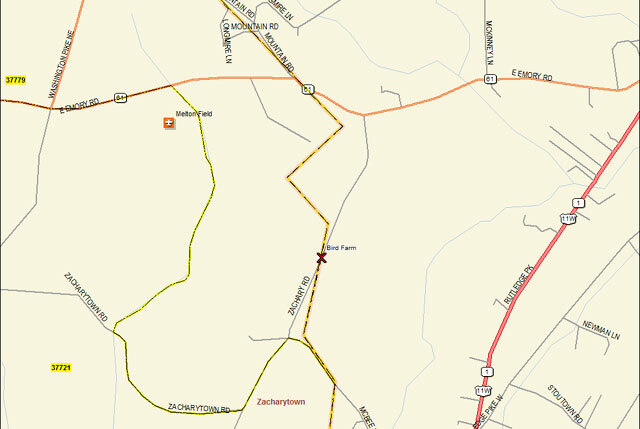 Heading east on route 61, look for the first little road to the right after you cross into Grainger county. This is Zachary road even though there is no sign to indicate it. Head down the hill and over the next rise. When you come to the sign “Bird Farm” turn right down the dirt road and follow it up the hill to a barn and metal building in the distance. This is a BIG commercial operation but surprisingly they say that they are willing to deal with small orders but only in such a way as will not interfere with their main business. Conditions: wood is green, you need to be careful of the heavy equipment, and you cannot pick through the piles looking for your “perfect” piece of wood (limit your searching to the tops of the stacks!). Red and white oak and poplar are always available, occasionally ash, cherry, walnut are around but they never stay long. Easy to find. Located on the north side of route 61 between Clinton and Oliver Springs. 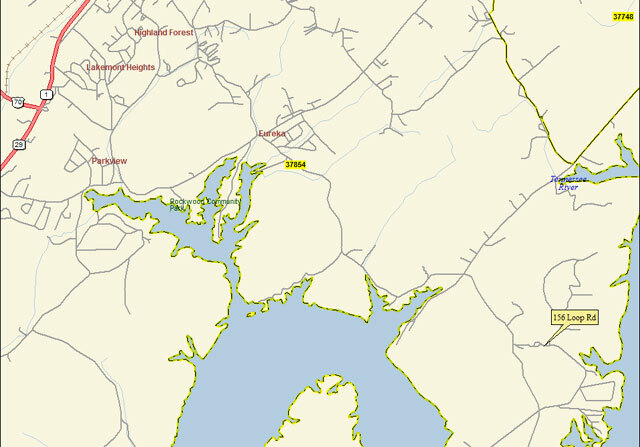 Note that Oliver Springs Highway IS 61 in this vicinity. A mid-sized operation that sells the standard local hardwoods. They deal almost entirely in green wood although the owner says he can supply kiln-dried if the quantity is sufficient to make it worthwhile. 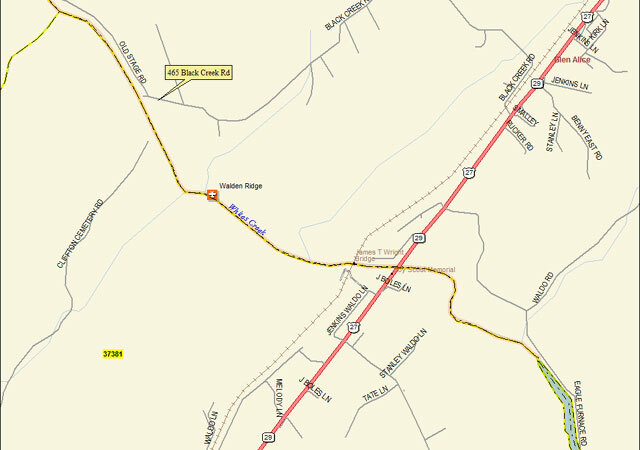 Located just east of the Washington county line on route 107/81 to the west of Erwin, TN. Another small bandmill operation which sells air-dried lumber. I’ve bought some of the best clear pine I’ve seen here at near-giveaway prices. Max does the best quartersawn sycamore I've seen but availability is always limited and what he saws disappears quickly. Head west on I-40 from Knoxville, then south on route 27. The only landmark I use is a big new concrete bridge on a four-lane section of the highway. Look for Whites Creek Road just past the bridge on the left. A bandsaw mill owned and operated by a woodworker who started out cutting wood for his own use. He also has a vacuum kiln but no surfacing equipment so all wood is sold rough. Most local species are available as well as quartersawing. This company has a bandsaw mill and a dehumidification kiln. It offers custom sawing and drying of customer’s wood but also has “a variety of species on the yard” available for sawing. They will sell by grade although this will entail calling in a certified grader which will add to the overall cost. They make a specialty of processing salvaged timber from construction clearing and beetle kill. I haven’t visited this one but included it because I ran into Mr. Price giving a demonstration of his portable sawmill at the East Tennessee Woodworkers Guild picnic. Yesterday Jeff Price sent me an email updating me on what services and products they offer. Rather than fuss a lot with writing myself I'll simply paraphrase his email, more-or-less verbatim: We are able to do large and long logs. The long dimensions can only be done at our farm. Large logs can be done at your site. We are also able to do slabs for those who need very wide wood. We have a kiln, planer, molder, and 4 sided planer to do flooring, paneling, and molding for custom orders. We also carry woods on site that can be bought as rough sawn, kiln dried, or a finished product. 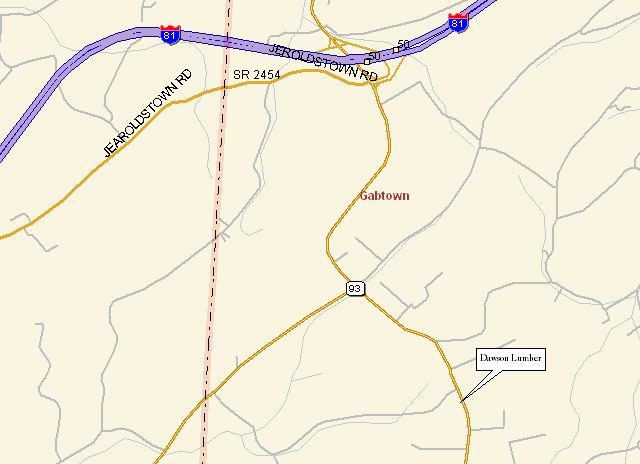 I didn't even have a clue about where Lancing, TN might be but Delorme Street Atlas 2004 assures me that it is on TN Route 62 not to far west of Wartburg. Clearly I've driven through it more than once and never noticed. Call ahead and ask for directions and to make sure that someone will be available. No chance to make a map yet but here is a business card to fill the space temporarily. I haven’t visited this one but include it for sake of completeness. .
No idea where this street is. Make sure you call ahead of time.